Early this morning, we told you that Chinese on-line retailer JD.com had received over 75,000 registrations for the first OnePlus 5 flash sale set to take place on June 22nd. Of course, since it is a flash sale, we won't know how many units will be sold sold until afterward. Meanwhile, OnePlus co-founder and CEO Pete Lau posted a message on his Weibo account that the OnePlus 5 is going to be easy to buy. The since-deleted post was a response to a comment posted by another Weibo user who wrote that the OnePlus 5 will be hard to find after the device is released next week. Historically, new OnePlus handsets have been hard to find right after their launch. In addition, Lau's remark could also be seen as a response to a rumor (since debunked) that OnePlus was about to bring back the controversial invitation system that requires a OnePlus purchaser to be invited to buy a phone. 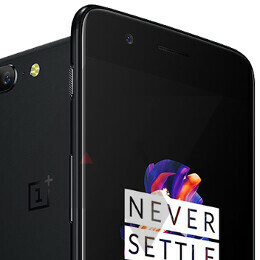 OnePlus used the system as a way to match up supply with demand. As a new company when it released the OnePlus One in 2014, it couldn't afford to spend the money to build handsets on spec. In addition, there is talk that the OnePlus 5 will be priced higher than its previous releases. This way, the company can take advantage of the strong demand for the new phone. One version with 6GB of RAM and 64GB of native storage could be priced in the $500 area. A premium variant with 8GB of RAM and 128GB of native storage could fetch close to $600. That is 25% more than the $479 that the high-end version of the OnePlus 3T was going for when it was launched in November. OnePlus 5 = iPhone 7+ design rip off. Why OnePlus why? If you had to copy the design , you should have copied something better at least. Why should the people who buy it look like they want an iPhone but can't afford it so they are "Settling" for the Oneplus 5. Poor mans iPhone. Sad Oneplus....very crappy decision. I obviously wont buy it , its quite embarrassing to be carrying an iPhone clone. You would look like such a wannabe carrying around something that looks like an iPhone but is actually a chinese android clone. Any self respecting guy wont . No, it's an oppo R11 ripoff. Exactly, how are people who claim to be android fans not aware of the R11? if i want an iJunk in the first place (which is very highly unlikely), i wouldnt have taken a look at other brands. OP fans are going to buy an OP not because of its resemblance of iJunk. The strategy worked Oppo in China because people still saw the iPhone as a status symbol. Now that Huawei (a refreshing Chinese brand known for more originality) is king though... I don't see why they are using their parent company's same old "copycat" strategy to push their phones worldwide? Don't get me wrong. Call me a hypocrite cause I'd gladly buy one if the price is right. But knowing the west, people care about fresh+original ideas and designs above all else. How the Oneplus 5 is gonna sell in huge numbers outside Asia is beyond me. Anything over $450 and the phone will flop. mark my words, if i wanted to pay more than that, i woul dhave bought the Samsung S7 edge or the current 8+. Hope it''t not turning into a nexus. Low price to start and then nexus 6...boom. same price as a samsung or iphone, and if you all remember it flopped. This year there are a lot of great devices around 500 USD. There is no even need to look for OnePlus 5. It was a great device when it was in close to 400 USD price range. But this year with a lot of competition and price range closer to 500 USD, OP5 is quite arguable offer. No saying bad, but there is a lot of room to shop around. Still looks like one of the best buys of 2017 to me if all the rumors hold true. I don't need supersized battery life. Waterproofing would be nice but I can live without it. Camera should be good - hopefully they don't over sharpen and saturate everything like Samsung/LG. Smaller size than the 3T. Hopefully still dual sim. Headphone jack, front fingerprint reader. No real skin or pointless features like bixby. The style isn't terrible even if it is somewhat copied. Probably a couple of hundred dollars cheaper at least. Probably my next phone. Here is hoping for sub $500. Check out other Chinese smartphones. OP is nowhere near as good as it used to be. Looks like you live a pretty compromised life. Great OP5 will be apt for you. Lots of great devices for $500 ? Seriously. There isn't a single one expect Oneplus. Or if you could enlighten all of us with the choices ? Sure? You can check Xiaomi Mi6 (dongle phone but still a excellent device) or say newly announced Honor 9. Last year's really great HTC 10 (I prefer it very much over latest U11). Also on some stores it's possible to find Huawei P10 for a little more than 500 USD and I would take it 1000 times over OP5 because of reputable manufacturer and reasonable customer support and warranty. There are plenty of choices for 500 USD. Personally myself would get something for even lower price. There is no need to spend a lot of money on smartphone nowadays. Huawei Nova 2 would fit my needs very well providing compact size, metal back, good design, good battery life for less that 400 USD. But that's a different story as this device doesn't belong to flagship class. How will it be easier to buy if they keep hiking the price! With that price there are too many OP killers out there. OP you lost it. like anyone who has a brain will buy this poor support from them is beyond me. They have zero support for updates. Price are going up for them so that pricing is gone. Of course it'll be easier to buy. At $500 they simply priced out a big chunk of their customers. At $500, I'd rather get a Galaxy S8, In the states, Samsung was offering the S8 at buy one get one, making each phone costing around $450. Sorry Oneplus, you abandoning your core.